If you’ve been reading this blog for more than five minutes you probably know that I love Dungeness crab. Come November every year, I eagerly await reports that crabbing season has begun, so I can make oven-baked crab, steamed crab, deviled eggs with crab, crab curry, chili crab — you get the picture. When I was in Chiang Mai a couple of years ago, I tasted a mild yellow crab curry that was out of this world. Soft and eggy, it was like a warm blanket of crab and spices (okay, that sounds kind of weird, but bear with me). I wanted to recreate that taste at home and I finally nailed it here. This is not just one of my new favorite crab recipes — it’s one of my favorite recipes, period. Freshly shelled crab is essential here. Go for the good stuff. 1. 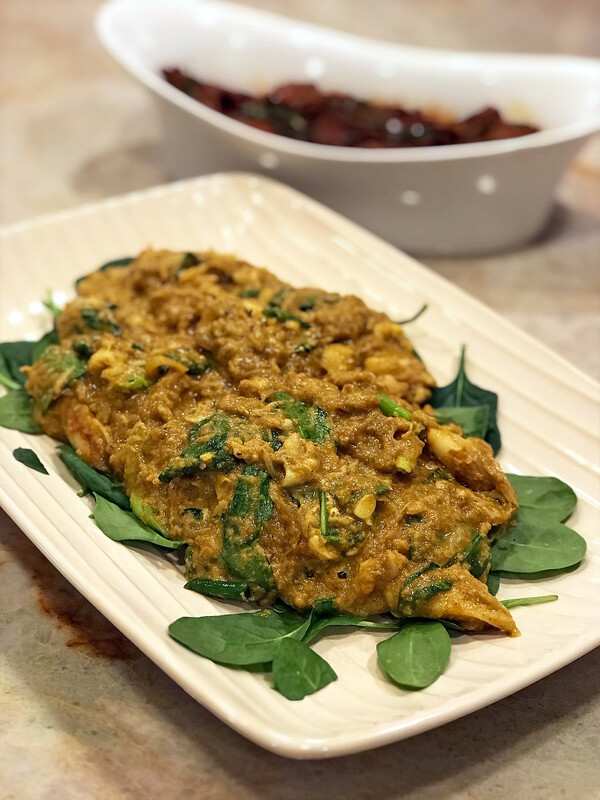 In a medium bowl, whisk the egg, half and half, fish sauce, oyster sauce, Thai seasoning sauce, and 2 tablespoons of the curry powder. 2. Heat a wok over high heat and add the oil. Add the onion, sugar, and the remaining 1 teaspoon curry powder and stir-fry until the onion is soft and translucent. Reduce the heat, add the egg mixture, and stir until it resembles a soft custard, about 1 minute. Add the crabmeat and 1 cup of spinach and toss to coat the sauce. Remove from the heat, add the green onion and a pinch of pepper, then toss to combine. 3. Spread the remaining cup of spinach onto a serving platter and top with the curried crab and serve warm.